A rabbit with a pocket-watch? Alice is an ordinary girl, until the day she meets a talking rabbit and enters a Wonderland of adventure... Sit back and relax while you listen to episode 1 of the classic tale of Alice's Adventures in Wonderland. Scroll down if you want to read a transcript while you listen. Did you enjoy that? Why not listen to another episode... or try our version of Jamaica Inn! Oh dear! Oh dear! I'm late! I'm so very late! Oh dear oh dear! A white rabbit! A talking white rabbit? Perhaps. But a rabbit with a pocket-watch? A rabbit with pockets? I must see where he's going! Alice had never seen a rabbit with a pocket, or a waistcoat, or a pocket-watch before. So, she ran after the rabbit as fast as she could, and when the rabbit jumped down a large rabbit hole, Alice jumped straight after him. Oohhhh… Either this hole is very deep or I'm falling very slowly. And what a curious rabbit-hole! Who would think a rabbit-hole would have bookshelves… and books… and maps… and jars of marmalade? Alice fell down, down, down. She fell for so long that she began to think about Dinah, her cat. Dinah will miss me tonight! I hope they'll remember her milk at tea-time. Dinah, my dear, I wish you were down here with me! Alice was beginning to feel quite sleepy when suddenly, her fall was over and she found herself sitting on a pile of leaves and grass. Oh, my ears and whiskers! How late it's getting!! Wait! Please sir, wait a moment! The White Rabbit ran down a long tunnel. Alice ran after him. But when she reached the end of the tunnel she found only a long hall with doors all the way round. Alice tried to open the doors – but they were all locked. Then she saw a table with a tiny key on it. These doors are all too big. There must be a smaller door somewhere. I wonder… hmmm, let me look behind this little curtain… ooh! a tiny little door! Let me try the key… What a beautiful garden! But how can I visit it? The door is so tiny – I can't even fit my head through! Oh! It's no use. I wish I could fold up like a telescope! Wait a minute… what's this? It certainly wasn't here before. A bottle – I wonder what it is? Let me see the label. Hmmm: Drink me… Oh! Oh! Ohhhhhh!!!! What a curious feeling! I'm folding up like a telescope! Alice was too small to reach the key on the table. She tried and tried to climb up the table leg but it was too slippery. When she had tired herself out with trying, poor little Alice sat down and cried. It's no use. I can't reach the key, so I can't get into the garden and that's that. There's no use crying like that! Alice! I advise you to stop this minute! Oohh… what's this? A little glass box… with cake inside! Ooh: and there's a note. Eat me. Hmmm. I wonder if it will make me grow...? If I grow, I will be able to reach the key. But what if makes me even smaller? Well, if it makes me smaller, I will be able to creep under the door. And Alice began to eat the cake. Did she grow big enough to reach the key? Or perhaps the cake made her small enough to creep under the door and into her beautiful garden. I'll tell you what happened next time. Goodbye. Cecily and Gwendolen both think they're engaged to someone called Ernest. When they meet it can't go well, can it? Jack has proposed to his darling Gwendolen, and she has accepted. But her mother is not happy. Algernon and Jack reveal they both lead double lives. But can Jack win the heart of the woman he really loves? 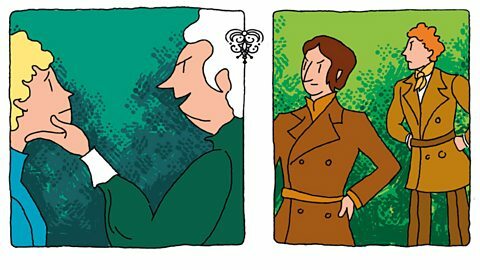 The Importance of Being Earnest, Part 1: Earnest or Ernest? The Vicar of Altarnum knows the awful truth about who killed Mary's uncle and aunt. She has a dangerous journey ahead now, but help comes from an unexpected place. Mary has gone to vicar's house. She wants to talk to him about the murder of her uncle but he's not there. But later he arrives and he has some important news to tell her. What can it be? After the shocking events on the coast, Mary's uncle is now planning to escape from Jamaica Inn. He fears that someone is coming to kill him – someone who has been giving him the orders to wreck ships. She has to escape first to tell someone what she has seen but who can she trust? Mary has been forced by her Uncle Joss to travel with him and his drunken men on Christmas Eve. She fell asleep but she's about to wake up and discover what Joss and his gang of bad men really get up to at night. Mary has to work in the bar of Jamaica Inn on Saturday night. She gets to meet a group of rough and drunk men. Later that night there are some strange goings-on in the yard outside. What's happening - and why are people talking about murder? Mary arrives at Jamaica Inn and meets her Aunt Patience and Uncle Joss. Immediately she discovers what a mean and scary man her uncle is. He sets the rules and tells her what to do. On her second day there she discovers a locked room – what is inside? When Mary's mother dies, she goes to live with her aunt and uncle who run the Jamaica Inn. It lies in a remote and bleak corner of England. On her journey there she is warned to keep away. But why? The crew are almost back in London, but will they make it home in time to win the challenge? Listen to the last episode of our drama, The Race, to find out! Sophia and Passepartout have recovered from the dodgy lobster that Phil cooked for them, but the crew aren't in the clear yet. Find out what danger they face next in this episode of The Race! Phil decides to say thank you to the crew by cooking a slap-up meal. How will it go down? Listen to episode eight of The Race to find out! Phil, Passepartout and Sophia have all fallen asleep while at sea! There's a loud bang – what's happened? Listen to episode seven of The Race to find out! The Mermaid has been stolen! But who has taken Phil's yacht and how will he get it back? Is it the end of his round-the-world adventure? Find out in episode six of The Race! The satnav is down and they've narrowly missed being hit by a container ship. Will Phil, Passepartout and Sophia be able to continue their journey? Find out in the next episode of The Race! Phil and Passepartout rescue Sophia from her violent husband and make their way onward from Sao Tome. But technology is about to fail them! What's going to happen? Find out in episode four of The Race! Phil makes it to port. But things are about to get tricky when a storm threatens his journey – will Phil and Passepartout survive their latest obstacle? Find out in episode three of The Race! Phil and his friend Pete set off on their round-the-world. Will it all be plain sailing or will they sink? Find out in episode two of The Race! Phil's a writer living in London. His life isn't that interesting – but it's about to change dramatically! Find out just how much in episode one of our drama, The Race! Ebenezer Scrooge has been taken to several different places by three spirits. He saw that if he died, nobody would care because he is a bad man. How will this experience change Scrooge's life? Ebenezer Scrooge is getting used to the company of ghosts, but here's one he doesn't expect. Ebenezer Scrooge seems to be changing his ways. He has learnt a lesson from a ghost which took him to the past and now is ready to be visited by the Spirit of Christmas Present. Selfish businessman Ebenezer Scrooge receives a visit from the first of three spirits. This is the Spirit of Christmas Past. In this episode, you'll get to know Ebenezer Scrooge. Nobody seems to be able to get a kind word or even a smile out of him. Alice is at the trial of the Knave of Hearts - and she is taller than ever before. The King asks the jury to give their verdict - but will the Queen let Alice escape without a punishment? Alice in Wonderland: Part 9: Who stole the tarts? Alice finds herself at a trial. Did the Knave of Hearts steal the Queen's tarts? What does the Hatter know about it - and what's that funny feeling Alice is having? Alice plays croquet with the Queen. But what are the rules - and how can Alice play croquet when the ball is a hedgehog? Alice finds the Hatter and the March Hare having a very strange tea-party. They manage to make Alice angry - but how? And do riddles always have answers? Someone inside the Duchess's house is angry - but who? The Duchess's baby is making some very strange sounds and the Cheshire-Cat smiles while the cook throws things. Will Alice meet anyone who isn't mad? Alice is beginning to wonder who she is, when a caterpillar gives her some advice about a magical mushroom. 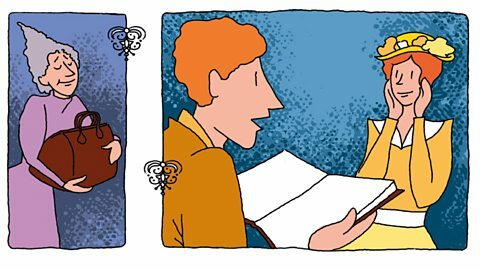 But is it good advice – and who thinks Alice is a snake? 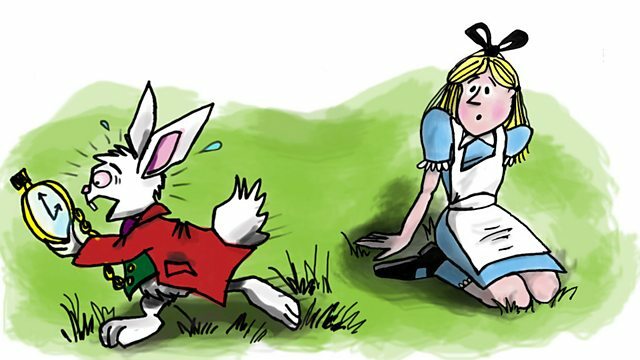 Alice is too big to fit inside the White Rabbit's house. The problem is, she's already inside it! How does she get out - and why is everyone throwing cakes? Alice meets all sorts of creatures as she swims around in a pool of her own tears. She joins in a Caucus-race: but how can you win a race with no rules? And who will give the prizes? Alice can't stay the same size for more than a few minutes! When she's big, she cries a pool of tears. What will happen to her when she gets smaller again? Viktor Frankenstein gets married and is happy again. But will it last long? The Creature is on the run and finally meets a good family. Will they accept it? Viktor Frankenstein meets the Creature at last. Will they be friends or have a fight? Frankenstein: Episode 2: It's alive! Viktor Frankenstein is ready to give life to a creature, but is this really a wise thing to do? Ceilia's latest idea from her management training is to get everyone to do a job swap. This will give everyone the chance to see what other people's jobs involve. This could be fun, but will Gordon be able to 'lower' himself to doing the work of a washer-upper?! Watch this to find out and learn some phrases related to empathy. Gordon changes his appearance to try and look fashionable but his work colleagues have their own opinions on how he looks and they can't keep a secret. Watch and learn some fashion-related phrases. Peter the waiter is shaken up when he nearly gets hit by a van but Gordon has no sympathy as he brags about his new mobile business venture. Can the two things be connected? Learn some phrases about honesty. It's been a late night for the team at The White Elephant but Gordon seems remarkably lively. That's until he hears about an award that only he could win! Watch and learn some sleep-related phrases. A VIP [Very Important Person] has decided to come and eat at The White Elephant and try out the food. Gordon cooks him something really special - but is it what the customer had in mind? Find out in this episode and listen out for phrases related to excellence. The White Elephant: Episode 16: Calm! The White Elephant restaurant has had so few customers it might have to close down. Ceilia comes up with an idea to attract more diners, but there's one person who's not convinced... Will Gordon the chef change his mind? Find out in this episode and listen out for the phrases related to resilience that are used. The White Elephant: Episode 12: Shock! What is the secret of Gordon's success? Even when Mary gets an important qualification, he claims his experience is much more important. However, something happens which proves who has the most experience. Who will succeed? Gordon, the chef, is usually an angry man but something in the kitchen has made him angrier than usual. Who can calm him down and get him cooking again before another customer disappears? The White Elephant: Episode 7: Late! The White Elephant: Episode 2: Quick! The White Elephant: Episode 1: Panic! Welcome to The White Elephant - the restaurant with no customers. How will they cope when someone finally comes for a meal? Can Gulliver remain in the land of the horses he loves so much? Gulliver is in the land of the giants, Brobdingnag. He is forced to perform every day in front of crowds of villagers, but his luck changes when a visitor from the royal palace arrives. After his adventures in the land Lilliput, Gulliver takes to sea again. This time he arrives in a country where he's not the largest, but the smallest... What will happen in the land of Brobdingnag? Gulliver is a hero after helping Lilliput defeat their enemy Blefuscu. But when fire breaks out at the palace, can Gulliver help? Following Mary's uncle's shocking confession - how he lures ships onto the rocks and drowns women and children - she escapes from the Inn and goes with his brother, Jem, to the horse market in Launceston. But things don't go to plan. Joss has returned to Jamaica Inn and is very angry about Mr Bassat's visit. He storms out of the house and sets off across the moor. Mary decides to follow him.